1 Bleed: The section that will cut off to final size. Bleed size is typically 1/8 of an inch (or 0.125 inches). 2 Safety Zone: A 1/8" (0.125 inches) cushion on the inside of the trim line. 3 Resolution: Must be 300dpi or higher for optimal print results. 4 Trim: Displayes the final shape of piece. The full color printing process requires artwork to be saved in four-color CMYK. 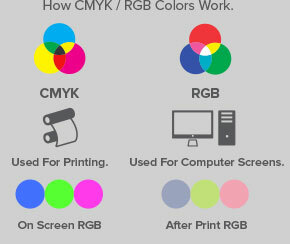 We recommend double checking your files to ensure that RGB color mode is convered to CMYK. If artwork and images are in black and white, pllease use the GRAYSCALE color mode. Outline your fonts. If you are submitting InDesign files, include a font folder containing all the type faces used in your layout. The minimum resolution for artwork is 300dpi. Make sure your link files or images are in this resolution or higher. Flattened High-Resolution TIF/TIFF or JPG. When submitting these types of files, include a separate folder containing all fonts, images and other graphic elements used in the artwork. For files larger than 10MB, we recommended that you compress your file using software programs like WinZip (for Windows) or Stufflt (for Mac). Please be aware that upload times will vary depending on internet speeds and file size. Typical upload times usually run between 1-3 minutes.